Everyday in the morning, passengers who have to take the EDSA route in Manila to reach their offices face a very big problem – traffic. This traffic continues not just in the morning, but throughout the whole day. If you choose to take the MRT, you better be prepared for long queues and jam-packed trains. Passengers have grown to bear and deal with it, because when you get pass the long dreaded queue, once you are in the train it’ll only take 15 minutes at most to reach your destination. The second option is taking a bus. Often jam-packed with passengers, the bus will travel along EDSA slowly, as other buses and vehicles compete for space and passengers. By the coming March though, there will be a third option: by taking the new COMET. 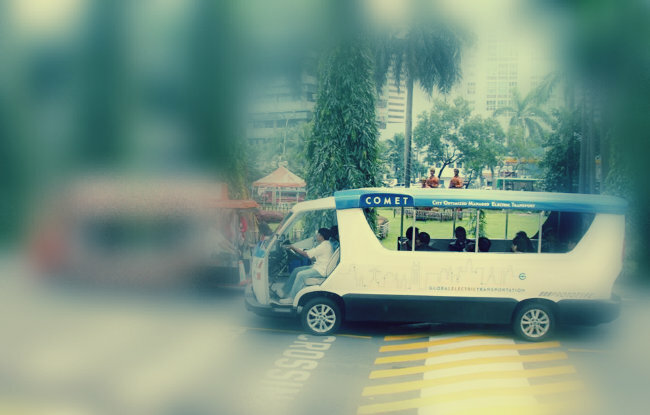 COMET stands for City Optimized Managed Environmental Transport. It’s a fuse of a shuttle and a jeep. It’s electric. It does not have gas. It’s steered by a driver but controlled by a centralized IT center. We had a chance to interview the makers of COMET earlier on Vulcan Post. The efficiency of the COMET translate roughly to a peso value that is half the diesel’s consumption. It does not consume electricity during traffic standstills. It is also very light. All these factors add up to make everything easier for the drive and passenger. GET Philippines director Anthony stressed the advantages of riding in the COMET in a report on GMA Television . Drivers will only use at least 400 pesos per day for charging the e-jeepney’s battery. This is unlike a regular jeepney, which need to be fueled to a total amount of a thousand pesos in a day. The e-jeepney also has air suspension technology, which allows the vehicle to descend slowly. This is crucial for disable persons, so that they can go on and off board easier. All other amenities combined, the COMET is designed for the passengers to have a better experience when traveling. And this experience will be proved once these new vehicles start traveling EDSA come March. The first route for the COMET will commence from North EDSA to EDSA Ortigas. North EDSA is where the northernmost end of the Metro Rail Transit System (MRT) is, where passengers board to travel to EDSA. Ortigas is a commercial area in Pasig, home to various businesses and tech companies in the Philippines. There is also an Ortigas MRT station. When the COMET hits the road this March, passengers boarding on the North Avenue station can choose to travel on the COMET if they are heading to Ortigas. Although there are only 30 COMET units launching this March, GET Philippines’ goal is to have 4,000 COMETS traveling in Manila by the end of the year. Of course, this will depend on the positive feedbacks of the public, which will then be reported by the media and by citizens themselves on social media. Let’s wait and see how this will turn out. Also read: Is COMET The Jeepney Alternative Manila Needs?